Controversial legislation that will grant an amnesty for thugs, politicians, protesters and military personnel caught up in the anti-government demonstrations of recent years has been passed by the Thai parliament. The bill will also allow for the return home of former Prime Minister Thaksin Shinawatra. The parliament passed a second and third reading of the bill for a blanket amnesty early Friday with opposition groups, in particular the families of people killed in the riots, holding an all night vigil organized by the Democrat Party. Thaksin has lived in exile since he was ousted by the military in a 2006 coup, launched after he and his family made nearly US$2.0 billion through the sale of telecommunications company Shin Corp to Temasek Holdings in Singapore. 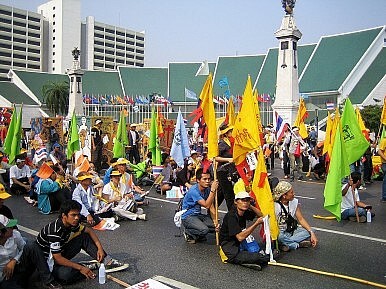 This also sparked the deadly yellow-shirt revolts and confrontation with Thaksin-backed red shirts. His sister and current Prime Minister, Yingluck Shinawatra, has been a primary driver behind the bill and the threat of its passage had prompted accusations that political expediency was winning out over justice for those killed or injured in violent political confrontations. More than 90 people were killed in anti-government riots in 2010 when tens of thousands of people camped in the heart of the city to try to force then Prime Minister Abhisit Vejjajiva to call early elections. Prosecutors had just this week threatened to charge Abhisit and his former Deputy Prime Minister Suthep Thaugsuban with “causing others to commit murders and attempted murders” through orders they issued to end the nine-week occupation of downtown Bangkok. Both men were opposed to the amnesty and said they were prepared to go to court to clear their names. A court has found that Thai soldiers were responsible for the deaths of six protesters but with passage of the amnesty both former leaders should now be protected from prosecution – whether they like it or not. The amnesty bill has also fed accusations that Thaksin is using his sister as a proxy to continue running his political and business empire from abroad, a charge her government and Pheu Thai Party reject, as opposed to returning home where he faces a two-year jail term for corruption. The legislation offers an amnesty for all people involved in political protests from January 1, 2004 to August 8, 2013. An exception, perhaps not surprisingly, is for those charged under Section 112 of the Thai Criminal Code, also known as the lese majeste law. Thai Tensions Escalate as Protests Gain MomentumThailand: Same Faces, New CrisisIndonesia Strike for Pay Hike; Thai Protest vs. Amnesty BillThailand’s Proposed Amnesty Law Sows Seeds of DiscontentJustice or Politics in Thailand?